Education is once again at the forefront of the political struggle for justice and equality. In the last years, new programs and schools, self-organized and project based learning environments focused on art and architecture have emerged, as well as structural reforms within formal education institutions. In these areas, there is a development of experimental and collective spaces to acknowledge forms of artistic research and knowledge production grounded in practice, context and lived experience and connected to social struggles in societies. Architectural knowledge in these collective learning environments have been deployed both as an analytic tool to redefine conceptual categories of the present and also as pragmatic and material form of activist spatial intervention. What is at stake in these experimental learning environments is the possibility to connect different urgencies without falling in the trap of universalizing or identitarian models. The ambition of Decolonizing Architecture advanced course is to create a research group to produce original collective artistic research. Decolonization is the critical position and conceptual frame for an architectural practice engaged in social and political struggles. During the course 2019/20 we will ask ourselves, which role have institutions of higher learning in the greater transformation of society? How can the knowledge that is produced inside its walls continue be relevant, useful for students interested in developing a practice engaged in social and spatial transformation? What kinds of spatial settings, structures or institutions are required for the accommodation of interests and subjects born from the interaction between students, teachers and the broader social context? How can the attention of educational institutions move from the production of knowledge – based on information and skills – to processes of collective learning, based on critical approaches, visions and shifts in perception? How can you reconcile theory with action by combining a rigorous understanding of the problems with pragmatic spatial interventions? The course aims to reflect on architectural and other spatial knowledges that emerge from sites understood as physical spaces, as well as communities, experiences and bodies. Based on the assumption that every student is a bearer of knowledge, the course participants research interests, methods, questions and urgencies serve as points of departure to establish a common methodology and a common vocabulary with the aim to come together in a collective ongoing artistic research project and an online platform, that is constituted by descriptions, conceptualizations, video essays, manifesto, photographic dossier and of forms of analysis and intervention. The course takes inspiration by the teaching philosophy based on the pedagogy developed in Campus in Camps ( www.campusincamps.ps) an educational program in Dheisheh refugee camp in Bethlehem as well as of other examples of artistic and experimental critical pedagogies. By activating critical environments learning we aim to strengthen self-driven participants intellectual trajectories and at the same seeking to contribute to the way universities understand themselves, aiming to overcome conventional structure. The advanced course Decolonizing Architecture (IV) is part of a five-year (2017-2022) sequence of courses that together form a platform for higher education and research on the topic of Decolonizing Architecture at the Royal Institute of Art in Stockholm. The courses are lead by Alessandro Petti, professor in Architecture and Social Justice in collaboration with Marie-Louise Richards, lecturer in Architecture and enriched by the contribution of advisors and invited guests. The course benefits from being located in a leading art institution of higher learning and its experimental artistic research environment. At the end of the first semester it is possible for course participants to apply for university funding in order to develop their research projects and present it to a wider public during the research week. The course is divided into two modules during one academic year. The semester is divided into three mandatory blocks per semester of intensive program with seminars, lectures, studios, mentorships, collective readings, site visits and walks. Between blocks the participants independently develop work, research, write, read, draw, interview, and conduct site visits. During the spring semester, more emphasis will be put on the production of a collective intervention/exhibition. In order to fully benefit from the collective research atmosphere we strongly advise to reside in Stockholm. However, we understand that this is not always possible, therefore non-resident students are asked to attend a minimum of six blocks and to submit substitute assignments. The course will also offer field trips in Sweden and abroad. Course participants are expected to pay for part of the costs. The field trips are not mandatory and for those who are unable to take part a substitute assignment will be given. The course is intended for those with studies or experiences in architecture, art, urban research, radical pedagogies, decolonial theory or activism who are interested in the ideological, social and political dimensions of Architecture. Selection is made based on previous projects and experiences and a motivation letter that together form the application. In the letter the candidate should state in which ways the conceptual frame of the course is relevant for her/his study. Ideal candidates are applicants interested in the ideological and social dimensions of Architecture, and in conceptual speculations and theories that are grounded and emerges from artistic and architectural practice. Candidates should be open to experimental forms of collective production that challenges individual authorship, and to an open-ended process oriented towards material and immaterial outcomes. The course requires the candidate to be able to efficiently manage independent study and production time between course blocks. Decolonizing Architecture: The Afterlife of colonial fascist architecture in Ethiopia and Eritrea from A DE SOUSA on Vimeo. Alessandro Petti This book is the first time we have really acknowledged the part of our practice that materializes itself as an installation or in an exhibition. Even though our projects can start or end as “art,” we have never fully documented or outwardly reflected upon this process. This book accounts for this important aspect of our work, one which has allowed some of our projects to exist. Charles Esche What do you mean by the art world allowing your projects to exist? ap Exhibitions play the role of a catalyst. Having to think about a project’s spatial manifestation gives us a certain autonomy from it, as it initially exists only in a specific site and for a specific community. Especially in the context of Palestine, it is very easy to be trapped in the NGO logic that quantifies success and measures impact statistically. The art world was ambiguous and remote enough for us to use it as a critical platform. Instead of being a self-referential space, for us, the exhibition was always a space for experimentation that could not take place elsewhere. Sandi Hilal Hannah Arendt, in one of her interviews, said: “when I write, I clarify my ideas through the writing.” For us, more than writing, art exhibitions are occasions for being in conversations, to explore and clarify ideas that are far away from our every- day reality. The conversation is a way to share doubts and explore suspicions. ce But also the artworks or the installations themselves, no? They also seem to be a way of concretizing some suspicions or ideas you have. The photographs and light- boxes of Refugee Heritage, for instance, give you a certain way to talk about and share your experience of being so closely attached to Dheisheh for so many years. ap One aspect that might clarify our relation with the exhibition space is that it always creates a space of tension. Since most of our projects are very site-specific, the exhibi- tion is a space of necessary alterity that allows us to clarify our understanding of the projects. This means that we never have the intention to either represent the projects themselves, or simply bring the social practice inside the museum. We are not interested in translating our work into exhibitions. For example, Fawwar Square took eight years of community participation to make. We don’t find it interesting to rep- resent or mimic this process in the museum. What is at stake for us in exhibitions is the ability to continue our explorations in different ways. We are not interested in institutional critique, as it tends to merely perpetuate the cultural hegemony of the modernist white cube. If we look at the museum from an architectural perspective, however, we could ask ourselves how to reuse the white cube of the museum for aims different from those it was design for. This speculative approach opens a much more constructive way to engage with it that is not only critical, but also engages in an ongoing process of its transformation. 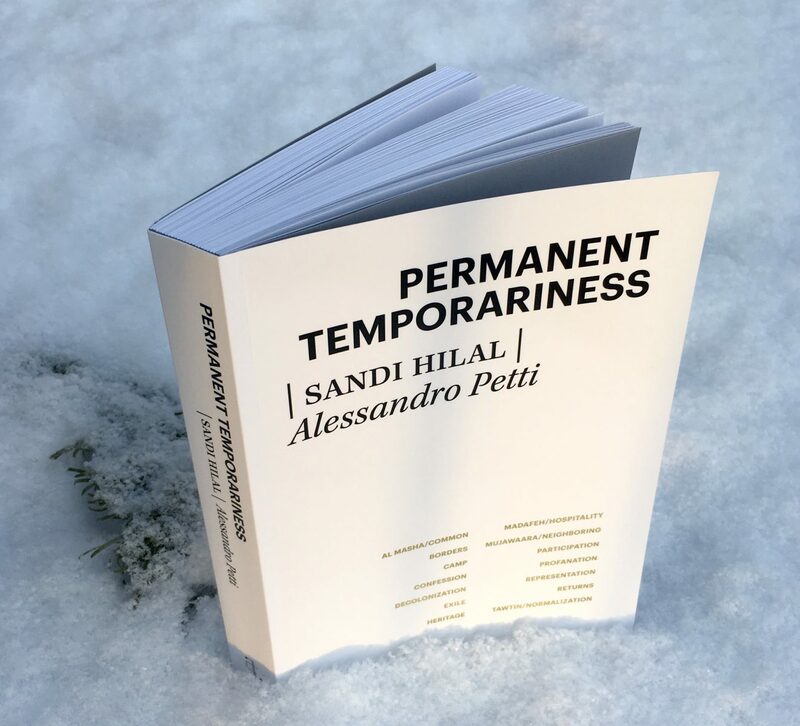 Permanent Temporariness is a book, a catalogue, and an archive that accounts for fifteen years of research, experimentation, and creation that are marked by an inner tension and a visionary drive that re-thinks itself through collective engagement. 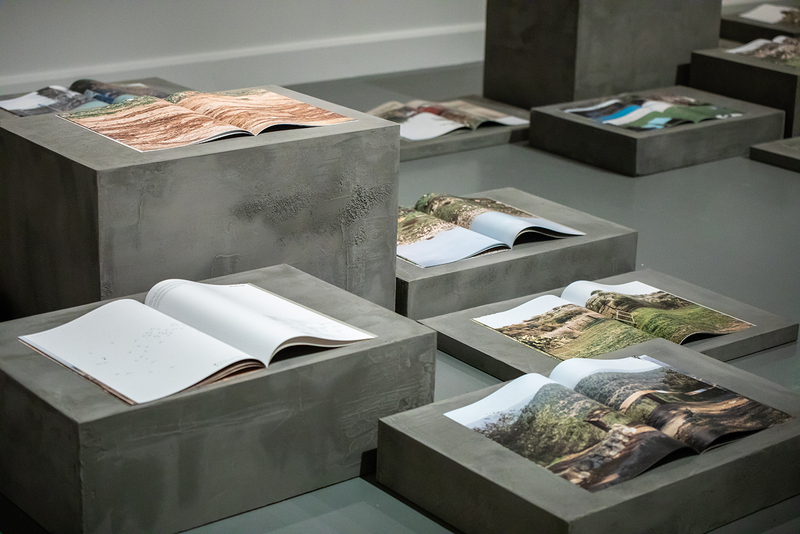 It is the result of the profound desire of its authors, Sandi Hilal and Alessandro Petti, to look back in connection with the eponymous retrospective exhibition that was inaugurated at the New York University Abu Dhabi Art Gallery on February 24, 2018, and at the Van Abbemuseum in Eindhoven on December 1, 2018. Since their first work, Stateless Nation at the Venice Biennial in 2003, and throughout their more recent architectural interventions in refugee camps, the artistic practice of Sandi Hilal and Alessandro Petti has explored and acted within and against the condition of permanent temporariness that permeates contemporary forms of life. In their ambitious research and project-based practice, art exhibitions are both sites of display and sites of action that spill over into other contexts: built architectural structures, the shaping of critical learning environments, interventions that challenge dominant collective narratives, the production of new political imaginations, the re-definition of words, and the formation of civic spaces. This book is organized around fourteen concepts that activate seventeen different projects. 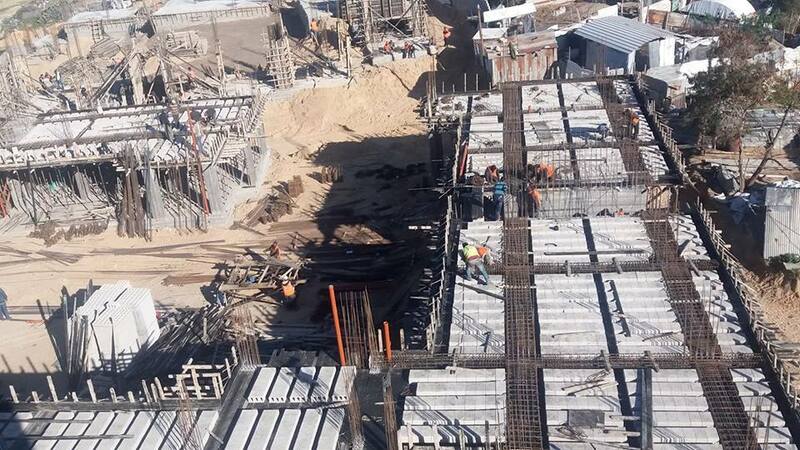 Each project is the result of a larger process of collaboration and is accompanied by individual and collective texts and interviews that contextualize and expand the reach of every intervention. 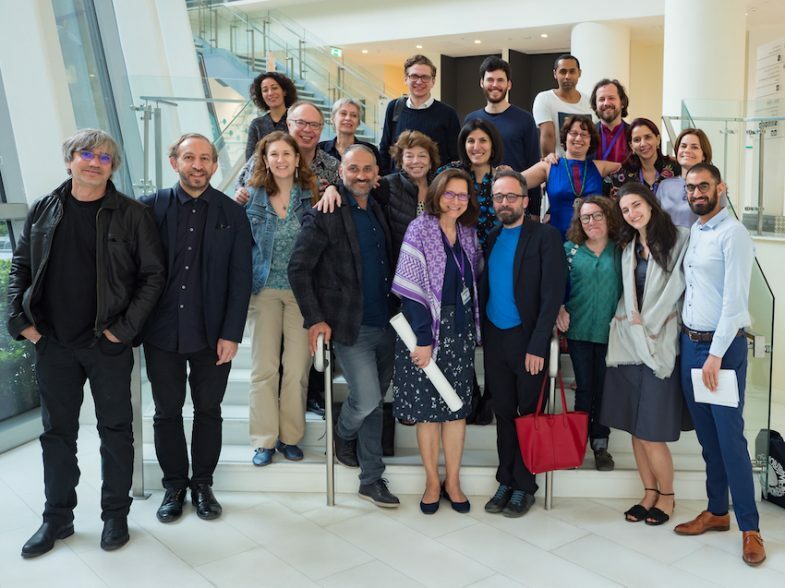 Contributors to projects and texts include Maria Nadotti, Charles Esche, Robert Latham, Salwa Mikdadi, Eyal Weizman, Okwui Enwezor, Munir Fasheh, Grupo Contrafilé, Murad Odeh, and Rana Abughannam. Edited by Maria Nadotti and Nick Axel. The publication of this book has been made possible with the generous support of the Royal Institute of Art, Stockholm; New York University Abu Dhabi Art Gallery; Van Abbemuseum; and the Foundation for Arts Initiatives. Al Madhafah the living room is a project created by Sandi Hilal, based on her experience conducting fieldwork for the Public Art Agency Sweden with refugees in the city of Boden, Sweden, in November 2016. Boden is a former military town located in northern Sweden, 80 kilometers from the arctic circle. From being a military town, it has now become an important reception center for asylum seekers. The project is inspired by a story about a Syrian refugee couple Yasmeen and Ibrahim, who had moved to Boden from Syria two years previously, and drew on the tradition of hospitality, never accepting that they should give up their right to be hosts in their new home. They continued what was an important part of their life in Syria, opening up their living room to host both Swedes and others. The living room, when opening itself to host the stranger guest, functions as a self-representational space, that has the potential to subvert the role of guest and host and give a different socio-political meaning to the act of hospitality. The possibility of hosting had become, for them, a way to regain access to their lost personal and collective history, combining their lost life in Syria with their new life in Sweden. By exercising their right of hosting and activating their living room, Yasmeen and Ibrahim no longer felt themselves to be statistics, passive guests in Sweden but to be owners of their own story. Over the past two years, the Public Art Agency Sweden, Bodenbo, Havremagasinet and the Defense Museum Boden have collaborated with the architect Sandi Hilal and Yasmeen Mahmoud and Ibrahim Muhammad Haj Abdullah in the Al Madhafah / Living Room art project. With common forces, a local living room has been created, a place where conversation, cooking, and learning become art and the exchange of knowledge. Al Madhafah / The Living Room in the Yellow House at Prästholmen is a work of art, but also a living room open to those who want to host new encounters. Living Room, a short film about the first phase of the project directed by Ana Naomi de Sousa, was commissioned by ArkDesk, Stockholm, with the support of Public Art Agency Sweden. Al Madhafah is a project by DAAR: Sandi Hilal and Alessandro Petti in collaboration with Yasmeen Mahmoud, Ibrahim Muhammad Haj Abdulla, and Ayat Al-Turshan. A network of various living rooms activated simultaneously in five different locations: the house of Yasmine and Ibrahim (1) and The Yellow House in Boden supported by the Public Art Agency Sweden (2), ArkDes Museum in Stockholm (3) Fawwar refugee camp in south of the West Bank (4), and in the living room of Sandi and Alessandro in Stockholm supported by the Arab Fund for Art and Culture (AFAC) (5). The five spaces interact, inspire, and feed each constantly. Art Happens (2016-2018) is part of the Swedish government initiative Äga rum, where the Public Art Agency Sweden was commissioned to produce examples of public art in the million program. After a long selection process, 15 areas were selected for implementation. Read more about Art Happens at statenskonstrad.se. Hospitality, involves committing oneself to rigorous ethical behaviour. It’s a real commitment, a responsibility. From the host to the hostage, from hospitality to hostility… Jacques Derrida’s in-depth analysis of the political uses and abuses of ideal hospitality leads him to suggest that political action should take place in the space between ethics and politics. Using the framework of the Host, the Guest, the Table, this day will unfold with a series of short presentations and round table discussions, arranged and moderated by Hans Ulrich Obrist and Paul B. Preciado, with Daniel Birnbaum. Public Luxury is an exhibition about architecture, design and the struggle for public life. Large-scale commissions, installations and projects inside and outside of the museum will give visitors an insight into the struggles and successes of design as it faces many of the challenges currently facing Sweden. The title Public Luxury sounds like a contradiction, but recognizes that everything in the public realm exists for more than merely functional reasons. Every kerbstone, bench, bollard, station sign, public toilet and street is part of the character and identity of a place. All the works in Public Luxury, many of which were made for the exhibition, share the ambition to tell a story about public life today. Architects and designers may not be able to change society, but nothing reveals how society is changing as clearly as architecture and design. Participants include Dansbana (Anna Pang, Anna Fridolin and Teres Selberg), Jonas Dahlberg, Sandi Hilal/DAAR, Johan Celsing, Hilda Hellström, Johannes Norlander, Åsa Jungnelius and Uglycute, among others. 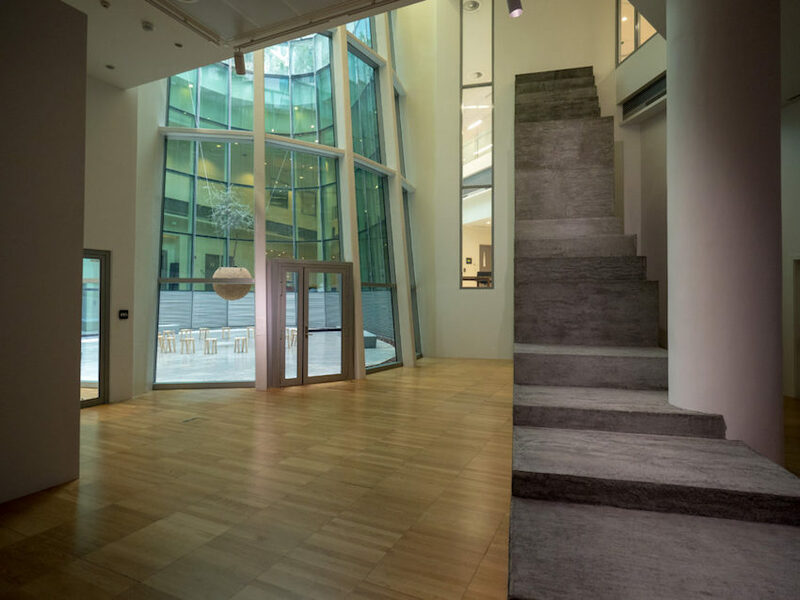 This mid-career retrospective exhibition of works by the artists and architects Sandi Hilal and Alessandro Petti covers their research and art produced over the last fifteen years. The curatorial premise for Permanent Temporariness questions the state of ‘refugeeness,’ a condition meant to be temporary, but that can become a permanent state of being. The artists examine temporariness, giving agency to refugees, both Palestinians under occupation and others, through alternative modes of articulating refugeeness at a time when the voice of the refugee is easily drowned in a sea of victimhood and alienation. As a result of political and natural calamities, there are currently over 70 million forcibly displaced people around the world. At the same time, globalization resulted in the movement of large numbers of professionals and a labor force from their native ‘home’ to temporary work locations, a move that subsequently turned into a life of permanent temporariness. This condition in the Gulf countries is referred to by the novelist Deepak Unnikrishnan as ‘Temporary People,’ living in between two homes, one an unattainable dream and another an economic necessity. Living more years away from home than at home imposes conditions and initiates new realities that characterize permanent temporariness. The artists examine this condition, focusing on Palestinian refugees, and also the recent waves of refugees from other nations. The artists’ work lies between conceptual speculation and an artistic practice that is based on spatial interventions in art, architecture, discourse, public research, and communal learning. Through research, publication, performance, video, film, photography, and interventions, the artists examine the relation between politics and architecture. Hilal and Petti’s art practice is fundamentally collaborative. 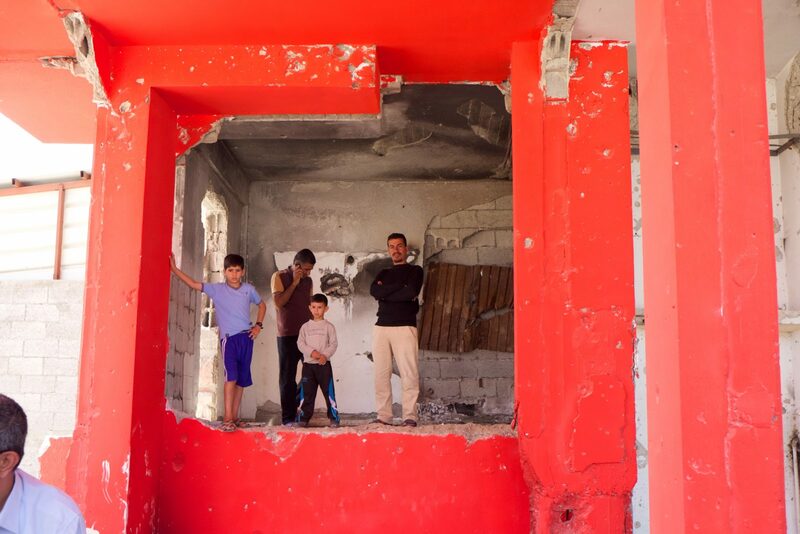 They adopted this approach early in their career, establishing a collaborative residency in 2007, along with Eyal Weizman: the Decolonizing Architecture Art Residency (DAAR), in Beit Sahour, Palestine. Since then hundreds of resident artists, architects and other collaborators have worked on a variety of projects that aim “… to find and utilize cracks and loopholes within existing colonial systems of separation and control [which] include built structures, infrastructure, land ownerships, and legal systems.” The Common Assembly installation in the main gallery is an example of such a project. In another interdisciplinary collaboration, The Book of Exile, an Emirati calligrapher inscribes the collected narratives of Palestinian refugees. As in the Refugee Heritage photo project, this is in conjunction with an on-going conversation that migrates between continents, from Palestine, to North and South America, Europe, and now in the UAE at NYU Abu Dhabi. Community engagement and collaboration is also at the heart of Mujawarah / The Tree School. This project is based on Campus in Camps, an ongoing, non-hierarchical learning initiative where Mujawarah is the sharing of knowledge steeped in the social, intellectual, and spiritual experience of the participants. Sharing and collaboration are key to all the artists’ projects, which in turn are related conceptually and/or in practice. 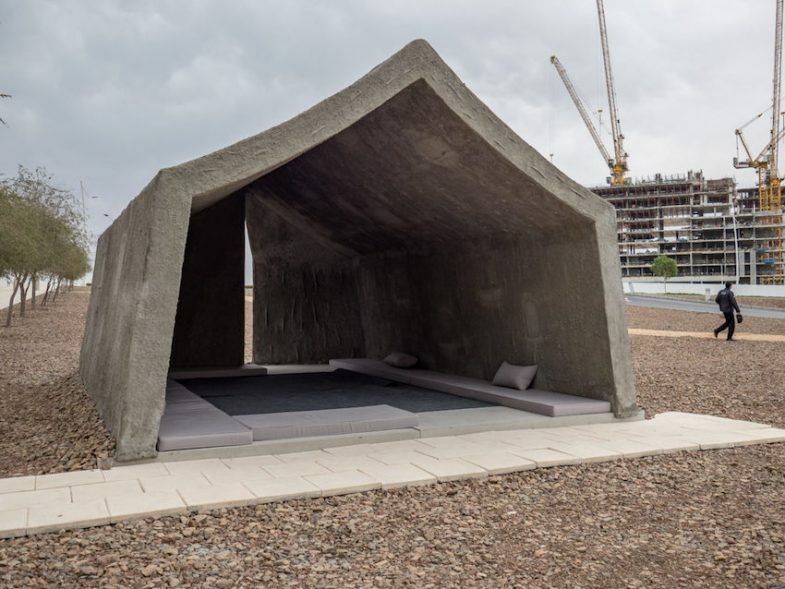 For example, The Concrete Tent installation was one of the sites for Campus in Camps that led to The Tree School installation, activated internationally and now at NYUAD. In 2016, Hilal and Petti initiated a discourse on ‘refugeeness’ as a state of being with a history and a heritage, both tangible and intangible, that should be explored, documented, interpreted, and officially inscribed on the UNESCO World Heritage List. The same proposition could apply to refugees from Iraq, Syria, Somalia, and the Rohingya or WWII European refugees. 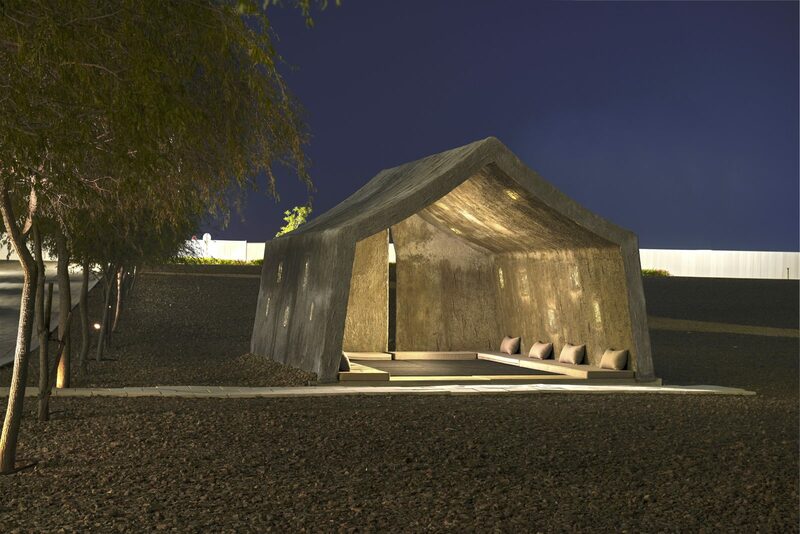 Hilal and Petti, along with their collaborators – teams of academics, architects, heritage specialist, and refugee camp committees – prepared the UNESCO nomination dossier as a DAAR proposal to inscribe the Palestinian Dheisheh Refugee Camp, located south of Bethlehem, as a World Heritage Site. They included in the dossier the first four required support documents on Identification, Description, Justification, and Conservation. Response to the Refugee Heritage dossier and discussions on its efficacy continue to take place inside Palestinian refugee camps and internationally. 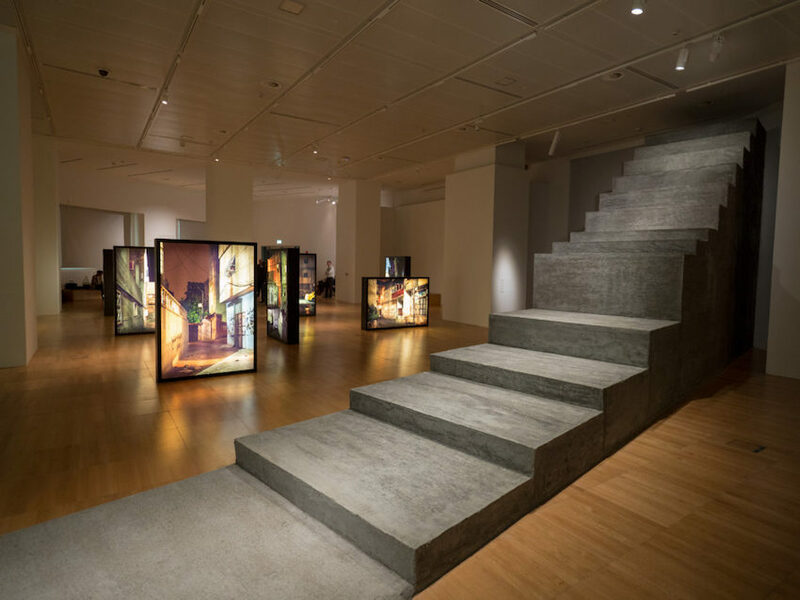 A similar discussion will take place in conjunction with this exhibition at NYU Abu Dhabi. Al Madhafah is a new performance created by Sandi Hilal, based on her experience conducting fieldwork for the Public Art Agency with Syrian refugees in the city of Boden, Sweden, in November 2016. The performance is inspired by a story about a Syrian refugee couple, Yasmeen and Ibrahim, and the importance of their living room to their welfare in a refugee camp. Yasmeen and her family intend for their Syrian living room in Sweden to become a space where diverse people can gather. The act of hosting enables them to go beyond being passive guests of a refugee camp, to become active hosts. In this powerful claim to what Hilal calls “the right to host,” the living room opens the possibility for refugees like Yasmeen and Ibrahim to combine their lost life in Syria with their new life in Sweden. The performance will take place during the exhibition’s opening week, whereby Hilal (a temporary guest herself at New York University Abu Dhabi) will host invited visitors at her apartment space on campus. 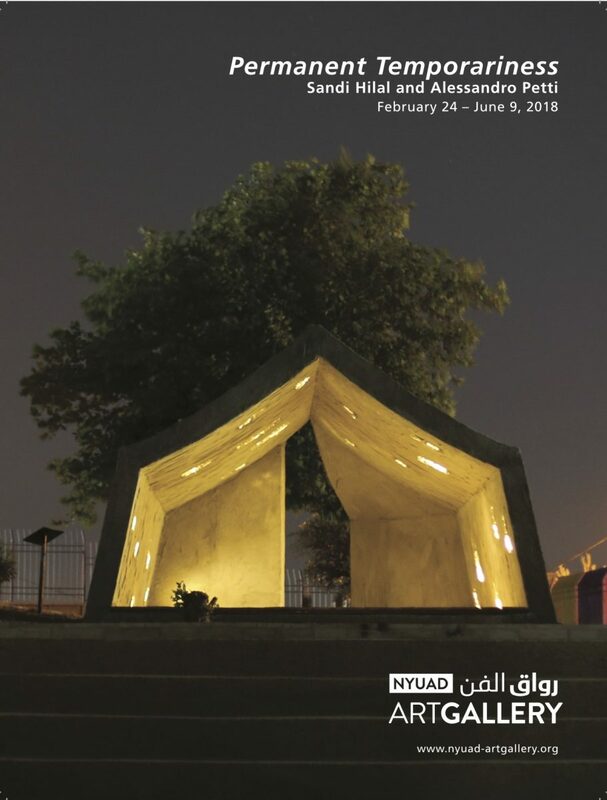 At New York University Abu Dhabi Campus, The Concrete Tent, originally conceived and built in the Dheisheh refugee camp, speaks to the many long-term residents of the city of Abu Dhabi and to the transient nature of the traditional Bedouin culture of the UAE. The visitor is invited to the library of New York University Abu Dhabi to witness a scribe/calligrapher copying “The Book of Exile”, thus upholding the longheld tradition of preserving and communicating knowledge from the Arab and Islamic civilizations to the rest of the world. In their practice Hilal and Petti have demonstrated a remarkable determination to pursue a subject that was limited to the domain of international humanitarian agencies for seventy years. Both artists are engaged with refugee camps in the occupied territories, and now with Syrian refugees in Sweden. Until recently, Hilal headed UNRWA’s camp development program while conducting research with Petti on the spatial politics of these camps. Over the last fifteen years the artists have initiated and collaborated with inhabitants of the refugee camps and others on projects that encourage multiple perspectives, an egalitarian pedagogy through sharing life experiences. They also initiated research through the DAAR Residencies, and conducted dozens of theoretical and pedagogical discourses that examine refugeeness, displacement, migration and memory. They continue to study the decolonization of the architecture of urban spaces under occupation, and civic representation and identity in the absence of a nation state. Their speculation on these subjects, among others, engage their audiences with the process of decolonization of discourse, examining the reconceptualization of refugee camps as sites for justice and the potentiality of refugee heritage as an agent for political change.